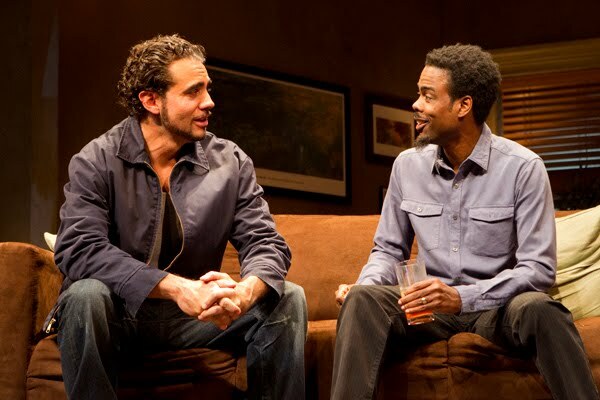 Jackie (Bobby Cannavale) and Ralph D. (Chris Rock) are sponsee and sponsor in “The Motherf**ker With The Hat.” Photos by Joan Marcus. It’s been tough on advertisers and reviewers alike. For the sake of propriety, how many asterisks should be used? For the record, the marquee and the Playbill go with just two. “The Motherf**ker With The Hat” has a profanity-laden script so maybe the title is fair warning of its contents. 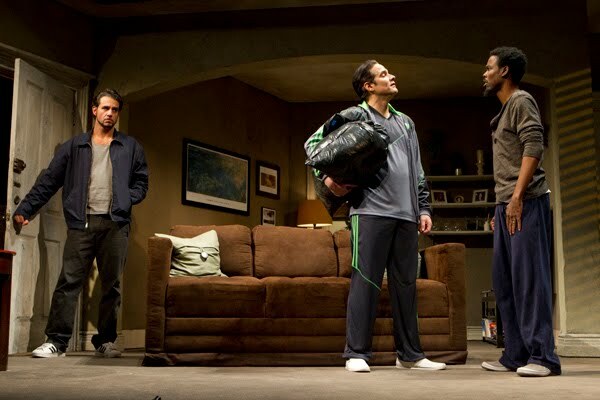 The title, however, does not do justice to the grace and poetry in its language nor the soulful heart of “The Motherf**ker With The Hat,” recently nominated for six Tonys. Originally meant for an off-Broadway run, the LAByrinth Theater Company production currently at the Gerald Schoenfeld Theatre through 26 June, gained traction once Chris Rock was onboard and earned playwright, SAG, his well-deserved Broadway debut. His work has also won a Tony nomination in the best play category. In “The Motherf**ker With The Hat,” Jackie (Bobby Cannavale), recently released from prison, comes home with a job and a bouquet of flowers for his girlfriend, Veronica (Elizabeth Rodriguez). While she is in the shower, he gets into bed, then notices a man’s hat on the table near the door. Jackie’s sobriety is severely challenged at every turn – by his own impulsiveness, by his girlfriend’s abuse of cocaine, and by his jealousy. Angered by the mysterious hat, Jackie moves in with his twelve-stepping sponsor, Ralph D. (the aforementioned CR), and his foul-mouthed wife, Victoria (Annabella Sciorra). It is also Ralph D. who accompanies Jackie to visit Jackie’s Cousin Julio (Yul Vazquez). Cousin Julio is going to stash the gun that Jackie used on the hat. BC, nominated for a Tony in the best lead actor category, is an amazingly controlled performer. His Jackie sings with conflicting emotions and the many contradictions in his life. ER, nominated for a Tony in a featured role, makes a resplendent Broadway debut, showing range and complexity in her portrayal of the edgy Veronica. Sadly, AS doesn’t have a bigger part in “The Motherf**ker With The Hat,” for she is always a pleasure to watch. Nominated for a Tony in the male featured role, YV is a nuanced character actor. He is lovely and tender as Cousin Julio whose loyalties are never in question. CR is at home and completely at ease in his stage debut. The Tony-nominated sets by Todd Rosenthal seamlessly unfold to reveal three very distinct apartments. Cousin Julio’s apartment is as eccentric as he is, filled with flowers and light. Veronica’s is a bit seedy, while Ralph and Victoria live in a spacious and well-appointed home. Anna D. Shapiro, nominated for best director, has brought “The Motherf**ker With The Hat” down to an explosively crisp hour and a half. Much of this beautiful, intelligent play is very funny. All of “The Motherf**ker With The Hat” is insightful and surprising.